This album is unfortunately named on two accounts. First of all, there are at least 13 other recording artists that have used the name Decibel. 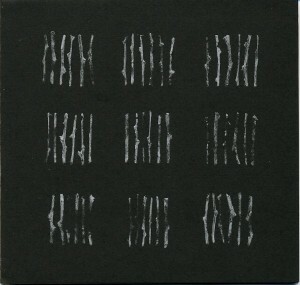 Second, there is an earlier release by Alvin Lucier called “Still and Moving Lines of Silence in Families of Hyperbolas”. While it would be interesting to hear the Mexican avant-prog group Decibel performing that early work by Lucier, what we have instead are first recordings of Lucier pieces by an Australian group. In the later years of Lucier’s compositional catalog, he seems to have fallen into a rut. Over and over again there are pieces written for acoustic instruments and sine waves. I can only guess it was an easy way out of writing commissions for varying instrumental ensembles. But it lacks the variety of sonic situations that made him such an important figure in the 1960s and 1970s. This CD is almost predictably opens with “Ever Present” (2002) for flute, saxophone and piano with slow sweep pure wave oscillator. Despite my grumbling, it still does result in a lovely piece. The spacious isolation of notes makes me think of the later Cage compositions, although the performance also has a tint of Feldman’s melancholy. From here the pieces thankfully become more diverse. “Carbon Copies” (1989) for saxophone, piano, flute and playback uses performer made environmental recordings as a pattern for action. The composition dictates four sections. The first is the environmental recording alone. The second brings in the instrumentalists who are attempting to copy what they hear on their recording. The third repeats this except that the original environmental recordings are only heard by the instrumentalist and not in the final mix. And finally after this work up, the instrumentalists play from from a memory of that initial recording. The results evoke a comparison with AMM for me. It could be the stabs of piano drawing to mind John Tilbury, but more likely it is the glacial sense of movement as both of the wind instruments focus on continuous sounds to mimic the ambient recording. So the version here is rather low key, which is in keeping with the overall timbre of the disc. It would be interesting to hear a recording of “Carbon Copies” by Challenge, the group that originally commissioned this piece, as a line up including Anthony Braxton, David Rosenboom, and William Winant would probably be very lively and quite a contrast to this. Drawing closer to stasis is “Hands” (1984) for organ with four players which preoccupies itself with subtle harmonic variances created by playing adjacent semitones in the midst of a large drone of sustained sound. The motion reminds me a little of the drone at the heart of Jon Gibson’s “Visitations”. But it is the closing piece on the disc, “Shelter” (1969) for vibration pickups, amplification system and enclosed space, which I feel is the most beautiful inclusion on the disc. The piece is simple and poetic and the results reflect this. Contact microphones are placed on the walls and doors of an auditorium. These pick up the subtle vibrations from the surrounding environment, including other musicians rehearsing elsewhere in the music conservatory, filtered through the substance of the room. The results are ghostly as the sounds are softened and seem to float through. Overall this is quite an enjoyable, peaceful and meditative listen, and perhaps a stand out among recent CDs of Lucier’s music. The recording quality is crisp which is important in a music where the highlights are found in the tiny details. The packaging is a smartly designed black and white poster folded down to a square of about 5.75″. So it will annoyingly not fit in with your other CDs. I can appreciate the dislike of jewel cases, but it is nice to have something with a spine that I can easily file to find again.